If you need a shady place in your garden or during a barbeque, you could use one of our awnings or pavilion covers, which consist of waterproof natural cotton. 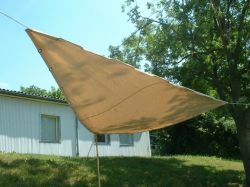 With an awning of Westernbedarf Halang you will enjoy the sunny season, schady and sheltered. We also produce canopies for cars and vans, balcony blinds, tarpaulins and more. 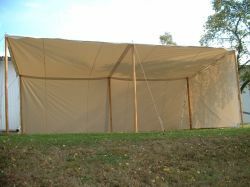 Furthermore we offer grand tarpaulins and "tent hats", most suitable for restaurants, beer gardens and outdoor-centres. Naturally it is possible to order tailor-made products.